HOMESTEAD, Fla. (November 17, 2013) – If anyone had any doubt that Kyle Larson was the real deal, perhaps Saturday’s NASCAR Nationwide Series Finale at Homestead-Miami Speedway might have been the proof that the 21 year-old Rookie is legit. Larson led a total of 54 laps and battled for the race win on the final restart before finally succumbing to Brad Keselowski to finish 2nd in the Ford EcoBoost 300. It was Larson’s 4th runner-up finish in 2013, his ninth top-5 and 17th top-10. Making his second career NASCAR Nationwide Series (NNS) start at Homestead-Miami Speedway (HMS) on Saturday afternoon in South Florida, Nelson Piquet Jr. looked to end the 2013 season on a high note in the Ford EcoBoost 300. Piquet Jr. and his No. 30 Omnitracs team started the weekend by qualifying 15th at the 1.5-mile multi-groove oval. After playing pit strategy and having fresh tires to close the race, Piquet Jr. brought his Omnitracs Chevrolet Camaro home with a 10th-place finish. 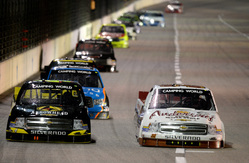 Shortly after the green flag dropped at HMS, Piquet Jr. and the rest of the field settled into the 200-lap race. The Brasilia, Brazil native was scored in the 20th position when the first caution of the day came out on lap 42. During the caution, crew chief Pat Tryson called Piquet Jr. down pit road for four tires, fuel and a track-bar adjustment for the No. 30 Omnitracs Chevy. After a great pit stop by his Turner Scott Motorsports (TSM) team, Piquet Jr. was able to maintain his position and restarted 20th. Piquet Jr. would maintain his top-20 position until the third caution of the day came out on lap 65 for debris. During the caution, Tryson once again called Piquet Jr. down pit road to pack the No. 30 with Sunoco Race fuel and make a track bar adjustment. 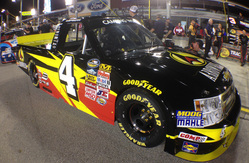 Piquet Jr. would gain one spot and restart 21st. A few laps after the restart, Piquet Jr. radioed to his crew that his Omnitracs Chevy was starting to get tight in Turns 3 and 4 and that he made slight contact with the wall. Piquet Jr. was able to hang on until the fourth caution of the day came out on lap 97 for debris. The caution came at a perfect time, as Tryson called Piquet Jr. down pit road for four tires, fuel and to fix the damage on the right side of his TSM machine. After taking time to make sure the damage was fixed, Piquet Jr. restarted in the 25th position. The Sunoco Rookie of the Year Contender was able to battle his way to the 21st position when the fifth caution of the day came out on lap 120. Deciding to play pit strategy, Tryson called Piquet Jr. down pit road to put on a set of Goodyear tires with 18 laps on them, and saving his last set of sticker tires in hopes of a late race caution. With some teams not pitting, Piquet Jr. restarted in the 22nd position. Tryson’s strategy played out perfectly, as the late race caution he was looking for came out on lap 148 for a spin in Turn 4. During the caution, Piquet Jr. came down pit road one last time to get his final set of sticker tires, fuel and make one last track bar adjustment. After the pit stop, Piquet Jr. restarted in the 21st position. It didn’t take Piquet Jr. long to start making his way to the front with fresh tires, radioing to his crew that the car was the best it has felt all afternoon. After a long late race caution, the field would restart for a six-lap shootout to end the race. With fresh tires Piquet Jr. was able to pass five cars in six laps on his way to a top-10 finish to end the 2013 season. .
Justin Allgaier started his final race of the 2013 NASCAR Nationwide Series (NNS) season on Saturday afternoon at Homestead-Miami Speedway (HMS). After two practice sessions on Friday afternoon, Allgaier qualified his No. 31 BRANDT Professional Agriculture Chevrolet Camaro in the 14th position for the Ford EcoBoost 300. Allgaier maintained a top-10 position for a majority of the day until a blown tire caused him to make contact with the wall, damaging his BRANDT Chevy. After battling his racecar in the closing laps, Allgaier drove the BRANDT Chevy home to a 19th-place finish for Turner Scott Motorsports. After rolling off 14th, Allgaier worked his way up to the 10th position on lap 23 and radioed in that his BRANDT Chevy was starting to get tight. When the first caution flew at lap 48, Allgaier relayed to crew chief Scott Zipadelli that his car was loose in and tight in the center. Allgaier came down pit road for four Goodyear tires, Sunoco fuel and adjustments. Allgaier restarted in the ninth position and communicated to his team that his car was really good on lap 69. Allgaier maintained the ninth position until the fourth caution of the race at lap 99 when he radioed in that his BRANDT Chevy was good and he just needed track position. During the caution, Allgaier brought his car down pit road for fuel, four tires and an air-pressure adjustment. Allgaier restarted in the eighth position on lap 103, and was in the seventh position on lap 122 when the fifth caution was displayed. Allgaier reported his car had lost grip and he came down pit road for fuel and four tires. He restarted in eighth position and after another quick caution he was in the sixth position when the seventh caution came out on lap 150. Allgaier reported his car was good and he brought it down pit road for fuel and four fresh tires. After varying pit strategies, Allgaier restarted 12th on lap 154. After another quick caution, Allgaier was in the seventh position on lap 177 when his tire blew causing him to hit the wall and spin out, ultimately bringing out the ninth caution. Under caution, Allgaier made two pit stops to change four tires, add fuel and repair fender damage. He restarted in the 26th position on lap 183. After the final caution of the race on lap 184, Allgaier finished the 200-lap race in the 19th position with a damaged BRANDT Chevy at HMS. After Saturday’s race, Allgaier finished fifth in the NNS Driver Point Standings. Kyle Larson and his No. 32 Target team headed south for the final NASCAR Nationwide Series (NNS) race of the year on Saturday evening at Homestead-Miami Speedway (HMS). In his NNS debut at the 1.5-mile track, Larson was immediately quick, recording the best lap in the weekend’s opening practice session. In the race, Larson consistently ran the best lap times on the track, pacing the field for 54 of 200 laps. With just three laps to go, Larson surrendered the lead to a car with fresher tires, crossing the finish line in second place. Despite not getting the win, Larson did get to celebrate on Saturday night after being crowned the 2013 NNS Sunoco Rookie of the Year. Larson wasted no time picking up where he left off in last year’s NASCAR Camping World Truck Series race at HMS, where he qualified second and led 48 laps before a late-race accident. His No. 32 Target Chevrolet Camaro was strong in both practice sessions. After running the best lap time in first practice, Larson was slated to go out last in Saturday afternoon’s qualifying session. With a lap time of 32.884 seconds, Larson earned the eighth-starting spot for the 200-lap race. However, it took him no time to begin working forward, as he gained three positions to take over the fifth spot after just one circuit around the mile-and-a-half track. Larson moved into fourth position on lap 15, and radioed his Turner Scott Motorsports team a few laps later to report that the No. 32 Target Chevy was tight on exit but good on entry. 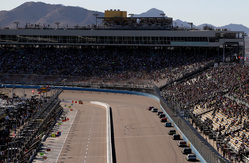 As the race’s long green-flag run continued, Larson kept up his pace, running solid lap times and moving into third on lap 31 before taking over the second spot two laps later. Despite getting into the wall on lap 35 and causing right-side damage, Larson continued to run the best lap times of the field. The 21-year-old took over the top spot on lap 40 and within a handful of laps, he had amassed a four-second lead. On lap 47, the caution flag was displayed for the first time and crew chief Trent Owens brought Larson to pit road for four tires, fuel and a small air-pressure adjustment. Larson restarted in the third position, where he remained until the second caution was called at lap 56. After starting in the third spot again, Larson slipped to fifth over the following 10 laps. Under the third caution period, Larson explained that his Target Chevy was not as strong as the other top cars on the short runs, but that he was good on the long run. This proved to be true, as Larson fell back to seventh after the next restart but worked up to third before the yellow flag waved again on lap 98. After Larson reported that his No. 32 machine was a little too tight on exit, Owens again brought his driver to pit road for four tires and fuel, along with slight air-pressure and wedge adjustments. After restarting in the fourth position, Larson moved into third on lap 103 and took over the second spot on lap 115. When the caution flag waved again at lap 121, Larson radioed to say that his car was really good. Wanting to stay on the same pit strategy as the other lead-lap cars, the Target team gave Larson four fresh tires and fuel, and the young driver returned to the track in the sixth position. On the ensuing restart, Larson went to the high side and moved from sixth to first in one lap. However, after another quick caution, he slipped to second on the next restart. Larson was still running second, but laying down the quickest laps, when the caution flag as displayed on lap 149. Again trying to remain consistent with others on pit road, Owens called for four tires, fuel and no adjustments to the No. 32 Target Chevy. Larson restarted the race in the eighth position on lap 154 but gained six spots to take over the second position before the caution flag waved later that lap. Larson took the green flag from the second position on lap 160 but immediately moved to the point. After battling back-and-forth for the top spot with the No. 54, the NNS rookie again moved into first on lap 169. Larson remained in the top position throughout two more cautions in the race’s final 30 laps. After restarting in first with five laps to go, Larson did his best to hold off his competitors with fresher tires. Despite being passed for the lead with just two laps to go, Larson’s valiant effort allowed him to hold on to the second position. Crossing the finish line in second, Larson earned his fourth runner-up finish in the NNS this season.